It seems ironic that an artist once referred to as “the most brilliant among French colourists, and the best painter of marine subjects” would be mostly remembered for who he taught or who he accompanied where. His own work, or perhaps some level of a quiet life, appears to have left little for historians to write about him. Much of this biography comes from scant mentions of his name by other, more famous artists. Sadly, when it comes to who Eugene Isabey was as a person, we know virtually nothing. Eugène Louis Gabriel Isabey was born in Paris on July 22, 1803. He was the son of Jean-Baptiste Isabey, who was himself a talented miniaturist, who was patronized by Josephine and Napoleon Bonaparte. We know Eugene had an elder sister because a portrait of the elder Isabey from 1795 by Francois Gerard included a daughter. However, that was the only reference to her that I found and I do not know if she survived childhood. I could find no information about Eugene’s mother and whether or not Eugene ever married or had a companion of some sort. Eugene traveled to Normandy with his father, French author Charles Nodier (1780-1844) and Alphonse de Cailleux (1788-1876), the future director of the Louvre. 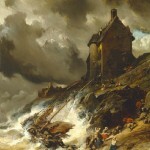 It is believed Eugene began to paint in Etretat (Normandy) in 1820 and produced some of the lithographs which appeared in his father’s work, Voyage en Italie par J.B. Isabey en 1822 in 1823. In 1824, he spent some time painting at Le Havre and would exhibit for the first time in the Salon. Only 20, Eugene would be awarded his first, First Class medal. He would be awarded First Class medals at the Salon in 1827 and 1855 as well. He was awarded the Legion of Honor in 1832 and became an officer in 1852. Isabey’s career would get an early boost from the “Societe des amis des arts”, a group who purchased 1,200 works of young artists between 1816 and 1838. They purchased works from Isabey, Auguste-Xavier Leprince (1799-1826), Jean Antoine Théodore de Gudin (1802-1880), Richard Parkes Bonnington (English watercolorist (1802-1828), Jules Louis Philippe Coignet (1798-1860) and others. The source which mentioned this group and their patronage of young artists did not identify how many or which works of Isabey’s they purchased. 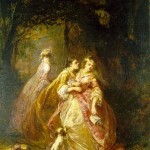 The accounts vary slightly in the details but in 1825, Isabey was in England with fellow French Romantic artist Eugene Delacroix (1798-1863) and Bonnington. 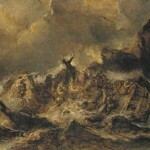 While there, Isabey studied the works of William Turner (1775-1851) and other English watercolorists. Little is known how the three artists happened to become friends but around this time Isabey began placing his watercolors on white or light backgrounds, a style seen in Bonnington’s work of the time. These light backgrounds made Isabey’s work starkly different than that of his fellow French artists who typically used dark or black backgrounds. By 1827, Isabey was back in Normandy. He became friends with Paul Huet (1803-1869) and the pair preferred working en plein-air. Isabey could often be found on the beach working on his paintings. Isabey, Huet, Dumas and Charles Mozin (1806-1862) were known to stay in the inn of Mother Ozeraic in Trouville because it provided them access to beaches that were not yet found by the aristocratic sun bathing crowds that were flocking to Brighton and the beaches that were becoming popular in Normandy. In 1829, Isabey contributed illustrations to the Voyage pittoresque et romantiques de l’ancienne France, a large work published by Charles Nodier, Alphonse de Cailleux and Isadore Taylor. They published 26 volumes between 1820 and 1863. In 1830, Isabey was commissioned as royal marine painter for an expedition to Algiers. Upon his return, the portfolio of watercolors and oils from that trip did not sell well. I found several mentions of his appointment and that his work didn’t sell well but did not find any details about the trip itself or examples of his work attributed to his time in Algiers. 1833 was a busy year for Isabey. 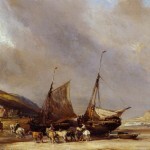 His painting Harbour at Low Tide was purchased by the State. He painted Plage a Maree basse. He also published a portfolio of six romantic marine landscape lithographs. I have yet to find an example of one of the paintings from this work but New York Magazine had an advertisement in 1969 of the piece being offered for sale for $1,100; so hopefully, there’s a chance I’ll eventually find one or more of them. Biographical information about Fritz Hildebrandt (1819-1855) has him studying under Isabey in Paris in 1844. Eugene Isabey is also believed to have been the mentor and teacher of Louis Adolphe Hervier (1818-1879), Johan Barthold Jongkind (1819-1891), George Loring Brown (1814-1889), Jean Baptiste Henri Durand-Brager (1814-1879) and Clara Montalba (1842-1929) who studied with Isabey for four years in Paris. Eugene Isabey was visiting Holland in 1846 which is when it is thought he met Jongkind who studied under Isabey in Paris. In 1867, a group of French watercolorists formed a society and called themselves the Société des Aquarellistes FranÁais. The group held themselves to an even higher standard than the Salon. Early members of the society included Isabey, Vibert (1840-1902), Alexander Louis Leloir (1843-1884), Jules Worms (1832-1924), Étienne-Prosper Berne-Bellecour (1838-1910), Jean-Baptiste Édouard Detaille (1848-1912) and a handful of others. One member of the group may be a bit of a surprise to French art enthusiasts. While he was condemning the Salon for being too severe in its standards, Edouard Manet supported and joined the French Aquarellists and was a full member. The historians at the Getty Museum said that his later works were “brightly colored scenes of violence, massacres, duels and looting.” I haven’t seen a compilation of his work organized by date, so for now, I’ll include their assessment and allow you to research that point further if you so desire. When it comes to his own work, Eugene Isabey is most well-known for his maritime art. He favorite watercolors but did do some engravings and oils during his career. He is often cataloged as a French Romantic painter though several resources mentioned him as a transitional artist between the Romantic and Impressionist periods – perhaps his association with Manet and the other French Aquarellists led to his work becoming influenced by that bold and colorful style. The photo of Eugene Isabey was taken by the French photographer and caricaturist known as Nadar (1820-1910) in 1860. 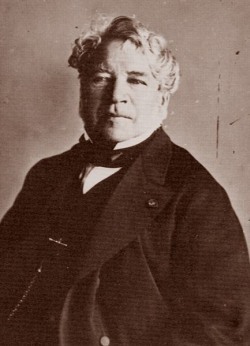 His legal name was Gaspard-Félix Tournachon. Isabey died in 1886 in Montévrain, France.